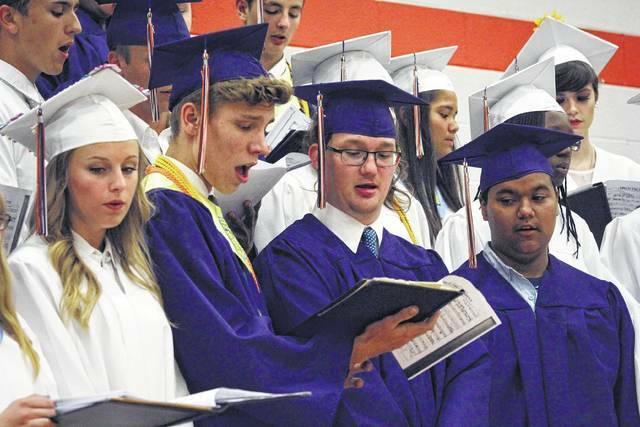 GALION — High school graduates celebrate the end of 13 years — or more — of education, mandatory tests, mandatory attendance and state exams. Such was the case Friday evening for 138 Galion High School seniors who received their Galion High School diplomas. Galion High School principal Ron Williams noted the achievements the GHS Class of 2017. “This is the best class I have had the pleasure to witness in my 20 years of education,” he said. 23 percent of those graduates plan to join the work force. 4 percent plan on joining the military. 28 percent plan on attending two-year college. 44 percent plan to pursue a four-year degree. Eyster introduced and contragulated class salutatorian Devin Baughn, who during highschool, managed to also earn an associates degree through the College Plus program offered in Ohio. She also introduced class valedictorian Brianna Wallace. Wallace has already earned college credit equal to the first two years of her post-high school education at Otterbein University. However, despite the celebration of deeds and tasks already achieved, high school graduation also is a time to look ahead. And that’s the message conveyed by speakers at Friday night’s commencement. Galion City Schools superintendent Jim Grubbs seemed to foretell the theme of the rest of the evening when he asked graduates: What does the future hold for you? What challenges await you? Greg Nickoli, a former Galion High School teacher and football coach — and current superintendent of Pioneer Career and Technology Center — reminded students that yes, the ceremony may be the end of one part of their lives, but there remains a lot of life in their futures. Galion High School graduate and retired English teacher Dave Spraw — Friday’s keynote speaker — offered his own advice on how to find the great ending Nickoli talked about. Be accepting of the advice of those who are older and more wise. Spraw also mentioned a recent initiative in Crawford County that is offering monetery incentives for college graduates to return to Galion. Through his years teaching and coaching in Galion, Spraw observed that the main goal of a lot of seniors is to just get out of Galion. He urged the 2017 crop of Galion graduates to reevaluate that goals, if indeed, that is what they are thinking. Thomas Shawk, president of the GHS Class of 2017, was the senior speaker. He recognized and honored friends, relatives and others who attended Friday’s program. “You can make yourself into whatever you want to be,” he said. 2017 Galion High School senior class president Thomas Shawk delivered an address Friday at Galion High School in which he urged graduates to not be fearful about tackling their career goals. GHS graduate Chloe McCleese smiles for the camera during Friday’s graduation program at Galion High School. Senior Dusty Thomas’s hat makes a lot of sense when you consider she was a member of Galion’s regional qualifying softball team this year. Senior members of the Galion High School choir entertain the audience Friday at Galion High School.